Here's an interesting piece I picked up last year, a Beano advertising poster for Smarties. In 1983 Rowntrees, the makers of Smarties, teamed up with D.C Thomson to produce these advertising posters featuring Dennis the Menace, Gnasher and Walter the softy. The posters are a strange size - 76.5cm x 40cm, not the usual A3 size you're more likely to see. 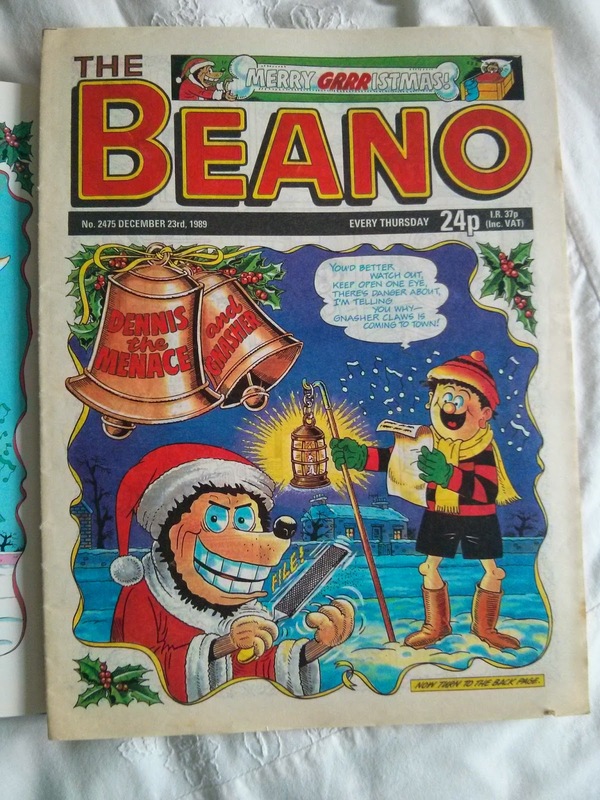 There are a lot of Beano related items around today but back in the 1980's there was hardly any, the above poster was probably amongst the first. As far as I am aware two posters were produced, the design you see above and a second design the following year. Unfortunately this is the best image I have of it, when it was auctioned on ebay recently. I own, even after seven years of collecting, just one girl's comic, a solitary issue of Princess Tina from 6th August 1970. In fact, until the other day, I had never even read it, it has sat in my 'to read' pile for over two years now, probably because the idea of a "girl's comic" didn't appeal to me. The first strip inside was The Happy Days, a comic strip written in the style of a diary of a young girl called Sue Day. The writing is very strong on this strip, the author has done an excellent job of giving it a child's voice in the captions using techniques such as listing (in the first caption), and the artwork is very solid too. The artist is Andrew Wilson and unfortunately the writer's name will probably never be known. Hugh McNeill, a well known D.C Thomson artist, had a two-pager in Princess Tina called The Trolls. It is about, obviously, trolls, who always annoy the owners of the garden they live in. The weekly strip is a promotional piece for the trolls toys (you know the ones - with the long colourful hair), and it must be said that this is amongst the better advertisement strips I've ever seen. There was one other humour strip in the comic - Willy the Wily Wolf. A funny one-pager about a wolf who, this week, is trying to impress a lady. I don't know who the artist for this page was. 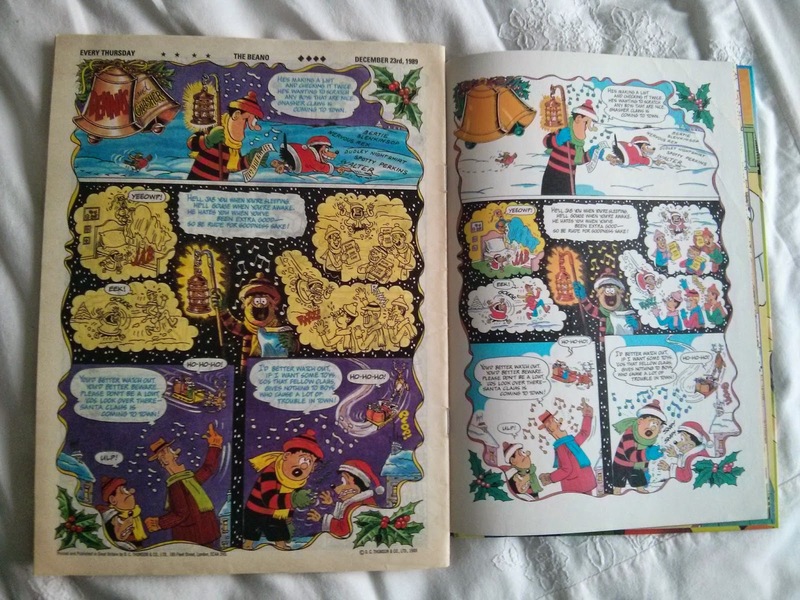 There were five pages that used full-colour in this comic, the front and back covers, the center spread and page 25. 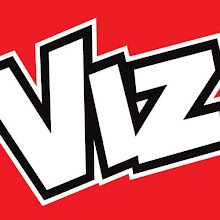 The centre spread was given to a photo of two Princess Tina readers wearing trendy gear, and a how brave are you quiz, so the only comic strip to recieve the full-colour treatment was Vicky in Australia. This is a reprint from Girl, in which Vicky used to travel the world in various adventures. Although not credited in Princess Tina, both the writer and artist are named in Girl - the story is by Betty Roland and the artist is Dudley Pout. That just about sums up this look at Princess Tina. Princess Tina is actually two comics not one, for it is made up of Princess and Tina, for when Tina comic folded it merged into Princess and instead of becoming Princess and Tina they decided to name it Princess Tina. I'll wrap up this post with the fantastic looking advertisement on the back page, for the Super Mousse chocolate bar. Yes, it's that time of year again which means we're going to take a look at an Easter themed comic! This time, we head back to 1981 for the slightly Easter themed issue of Jackpot. 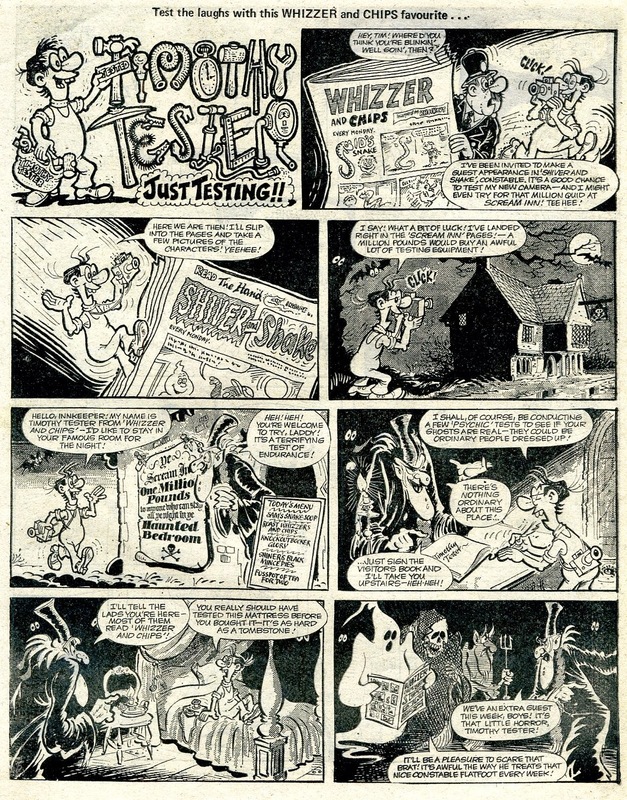 The strapline promises 'Easter Fun Inside' and it doesn't lie for we do, but not very much of it, as just four of the 21 strips are themed. The first of those four strips is Laser Eraser. For those of you unfamiliar with the strip, Laser Eraser is about a boy named Ernie who has a special laser that can make things disappear and reappear, but what he doesn't know is that he is actually zapping them up to the alien spaceship that dropped the laser, and then bringing them back again. Illustrated by Bob Nixon, Laser Eraser seemed a popular strip in Jackpot and survived the 1982 merge into Buster. 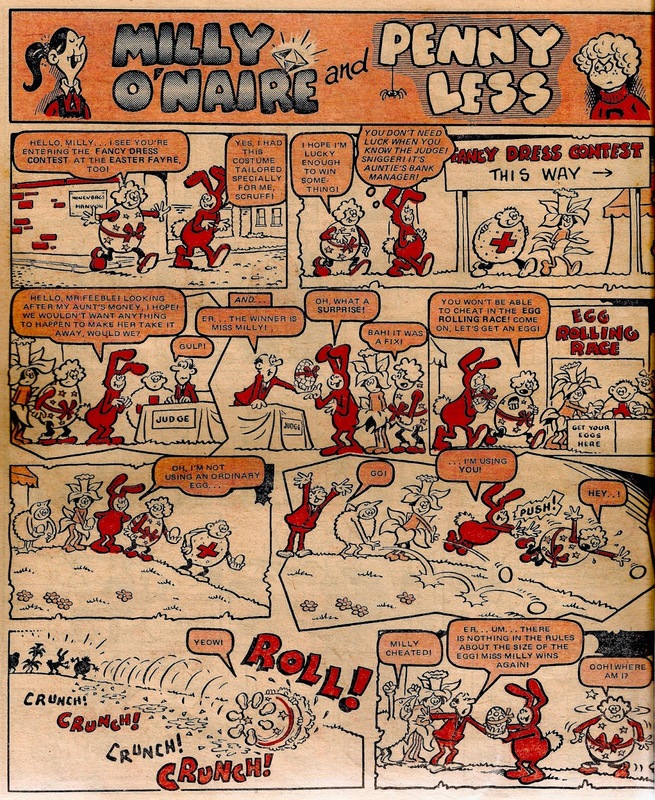 I was expecting 'It's A Nice Life' to be Easter themed but I was wrong, for the second of the four strips comes two pages after that in the form of Milly O'Naire and Penny Less. 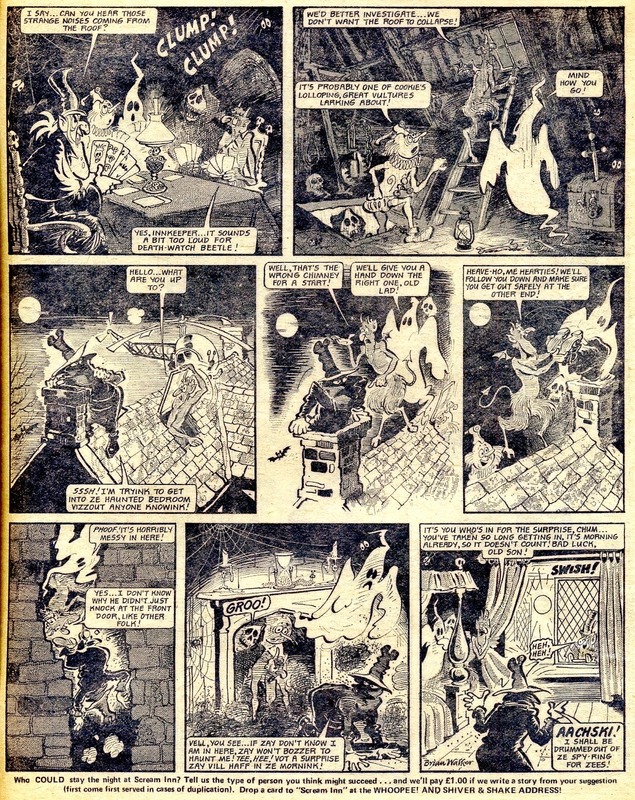 Along with their counterparts Ivor Lott and Tony Broke (who don't appear in this strip, but do in their own and combined strips), they are amongst the better strips that have a rich vs. poor theme, and, illustrated by Sid Burgon, they four of them proved very popular for many years. Next up is Sporty, illustrated by John Geering. Sporty is about a lad who is good at all sports, in fact - you name it, he's done it. For an Easter theme I'm sure you can guess what sport he participates in this week. 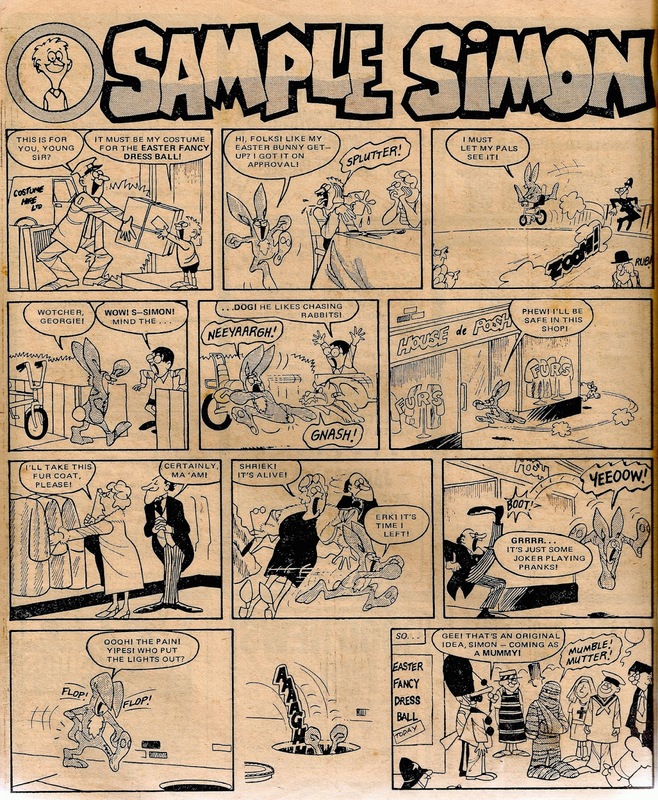 Finally, the last Easter strip for another year is Sample Simon. Usually Simon will test free samples but this week's strip seems to avoid that, or perhaps he somehow found a free rabbit costume sample? Who knows - anything can happen in the world of comics! I believe the artist might be Mike Green, but I'm not sure. And that rounds up this Easter post for 2014. All that's left to say is... Happy Easter! 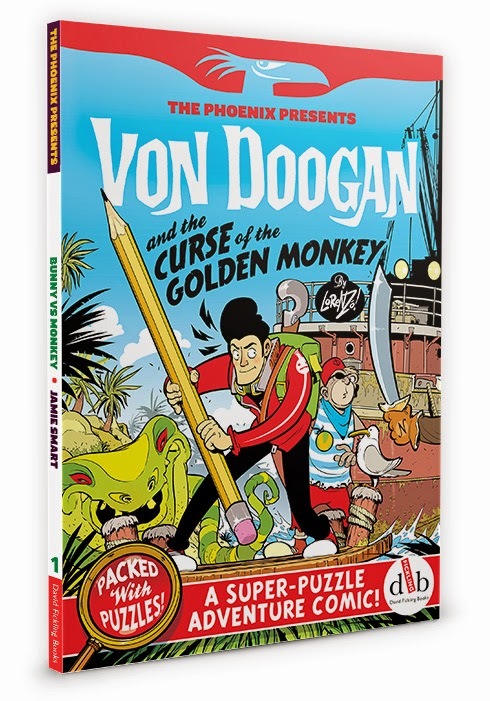 The Phoenix have launched 'The Phoenix Presents', a series of books in which they will be publishing collected comic strips. 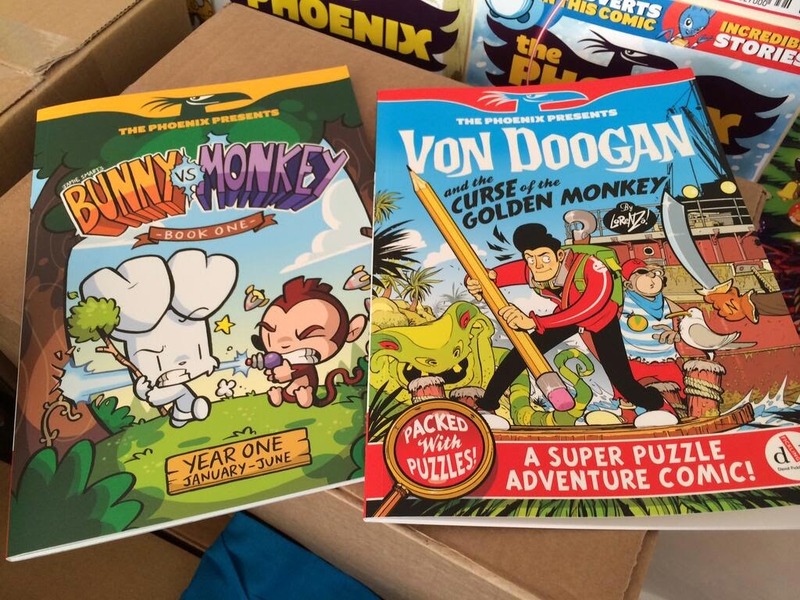 The first two books have been announced, Jamie Smart's first six months of Bunny Vs. Monkey and the first year of Von Doogan, by Lawrence 'Lorenzo' Etherington. 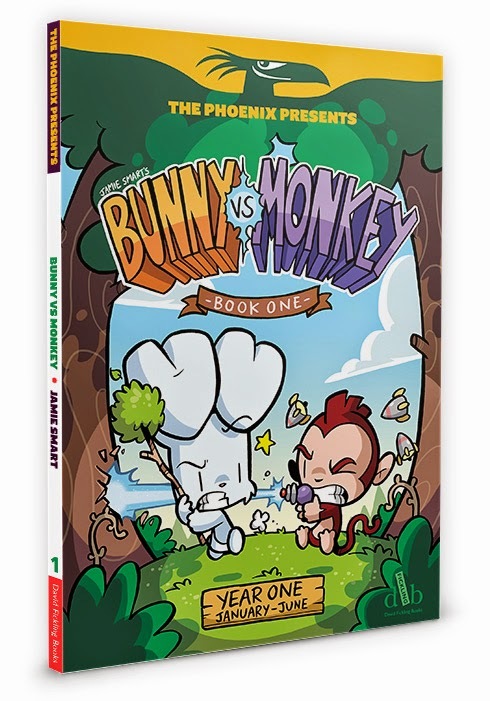 The Bunny Vs. Monkey Book is 64-pages and the Von Doogan book is 48-pages, and they are both to be released in June this year. Pre-orders are available and if you pre-order you can get them for £5.99 each, £1 less than the full price. The Phoenix have announced that they will be producing nine books this year, and the third book will be Corpse Talk coming out in July. The other books will include Star Cat, Gary's Garden, Pirates of Pangaea and Long Gone Don, but I am unsure of the final two titles. The Phoenix will be having a proper announcement some time in the next week, which I'm sure will reveal more details. The first two books can be pre-ordered from the Phoenix website, just click on the link below. 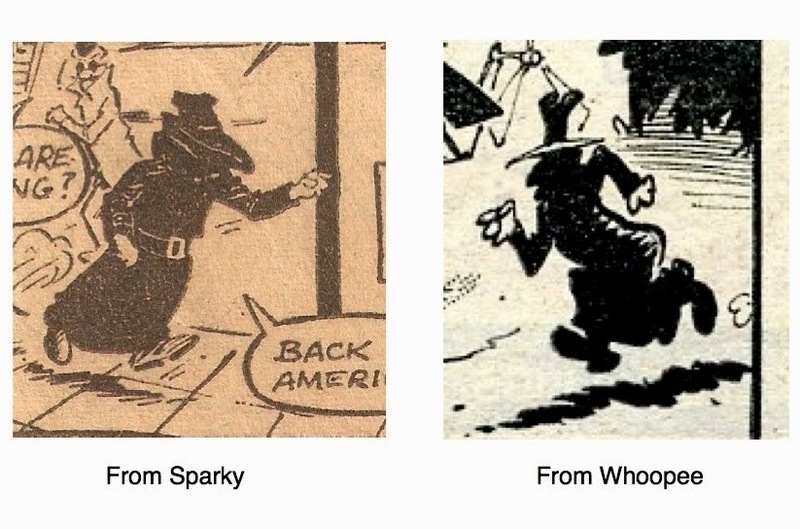 A few days ago in the comments section of my previous post, Irmantas mentioned that I Spy, a D.C Thomson character from Sparky, appeared in a Scream Inn strip, in IPC's Whoopee comic, in the issue dated 26th October 1974! Here is that strange, inter-companies crossover in full, illustrated by Brian Walker. This wasn't the only crossover mentioned. A few months earlier in the 2nd March 1974 edition of Shiver and Shake, Timothy Tester, a Whizzer and Chips favourite, leapt out of the pages of Whizzer to test Scream Inn, and to try his chances of winning the million. Here is the two-page strip. The menu boards in Scream Inn are always interesting, so be sure to take note of it in this strip. 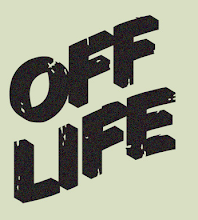 And whilst you're there, be sure to check out the whole blog - there's lots if interesting stuff! Crossovers between characters aren't a rare occurrence in British comics; I've shown a number of them on this blog. It is rare, however, for a character to cross into a companion comic published by the same company. 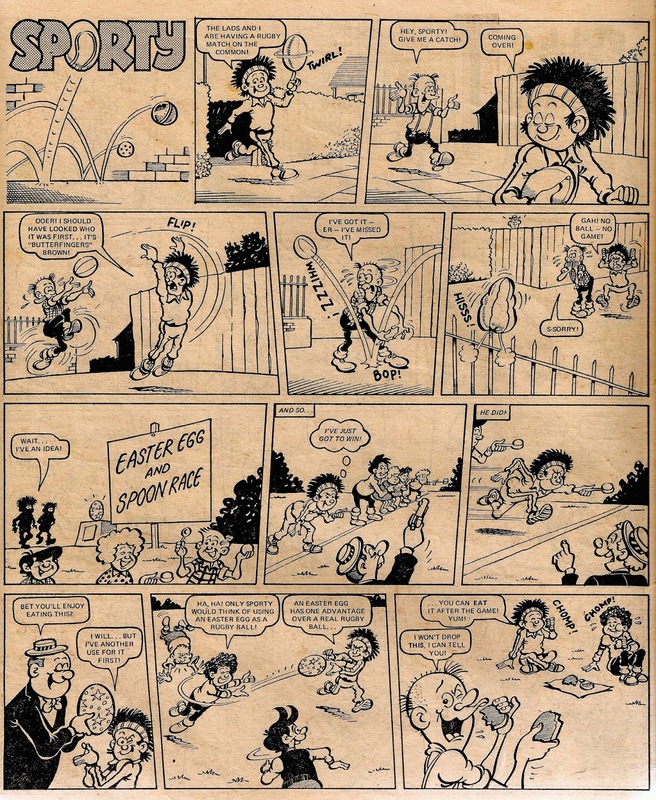 Sure, the Beano and Dandy characters have done it a few of times, but I can think of only a handful of times it has appeared in an IPC comic, one such time being this one from 1975, when Tiny Tycoon, a resident of the Whizzer half of Whizzer and Chips, walked into Whoopeetown, right up to the front door of Bumpkin Manor! Here is the appearance in full; the art is supplied by Tom Williams. Should you wish to buy yourself a copy of this issue, here is the front cover to look out for - dated 21st June 1975. Buster Monthly was late to the shelves, and was the final of IPC's 'Big Three' to get a monthly collection in its name. 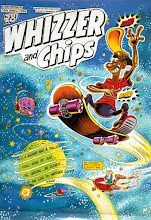 Whizzer and Chips was the first, with issue one appearing in November 1984. 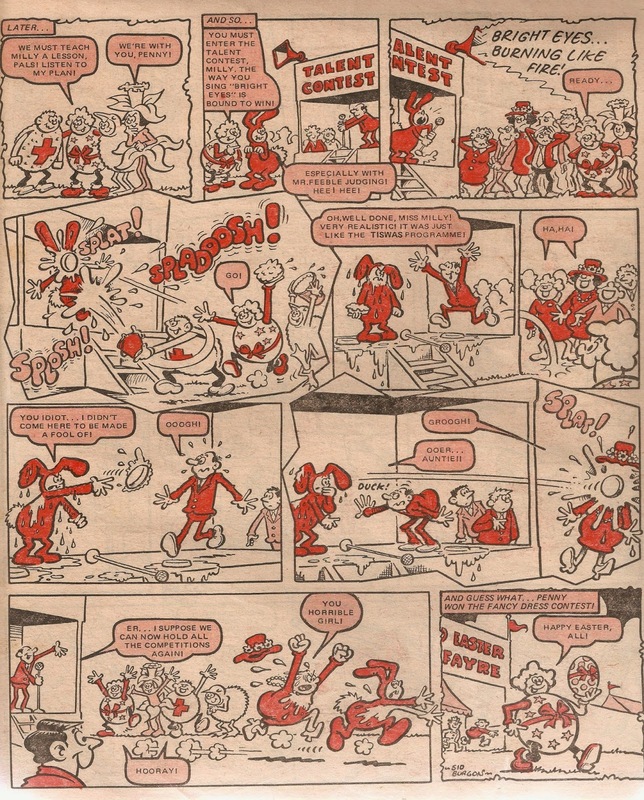 I'm yet to investigate Whoopee's Best Of Monthly comics, but the earliest I have is October 1985 - well before Buster. In fact, despite being IPC's most popular and longest running title Buster didn't get it's first 'Best Of Monthly' comic until May 1987. Here are a few adverts promoting the launch. The last one is just an edited version of the first. As with all the monthlies, it went on sale about half a month ahead of the cover date, this one hitting the stores on 11th April. Here's the finished product that kids would have seen on the shelves. 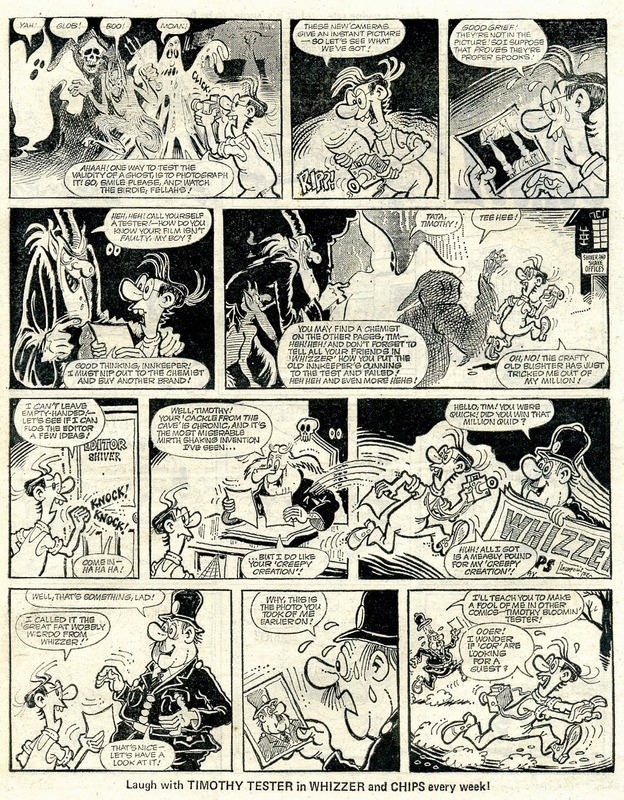 As with the Whoopee and Whizzer and Chips monthlies, Buster continued until January 1995 (dated February), when they were merged together to produce the short-lived BVC. 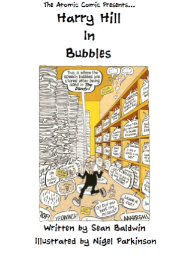 Ninety one issues of The Best Of Buster Monthly were produced. It can be interesting to compare an original story with the reprinted one, to see what changed. 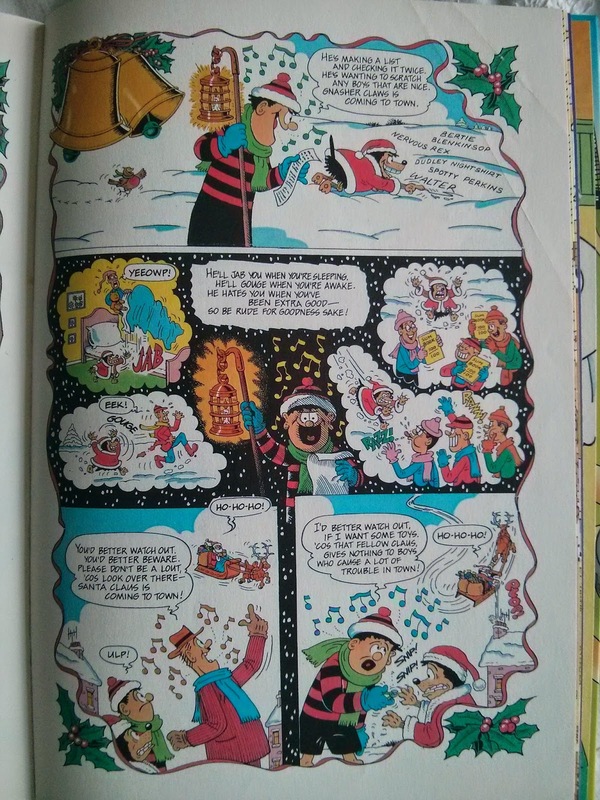 In the 2003 Dennis the Menace annual they reprinted the Christmas story from Beano #2475 from December 23rd 1989, that year's Christmas issue. 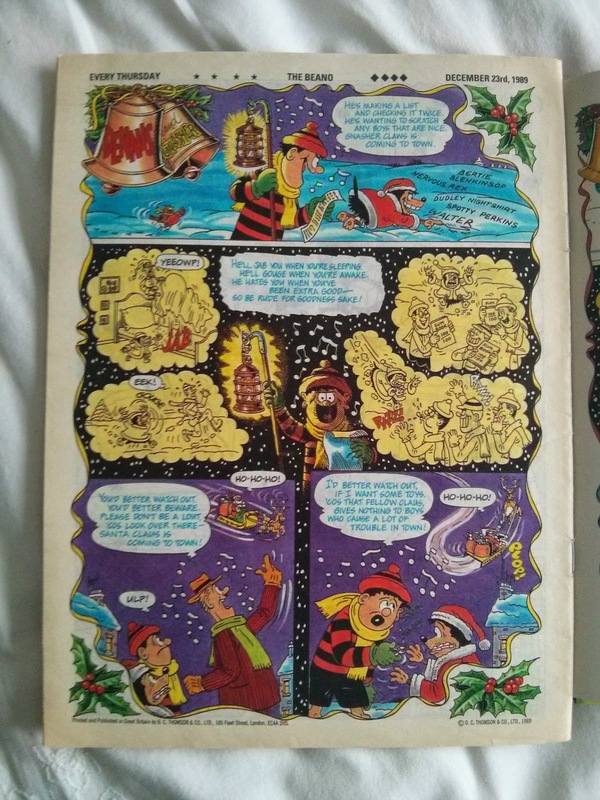 Originally just called Dennis the Menace and Gnasher, the annual renamed it to 'Dennis the Menace and Gnasher in a Christmas Chortle', adding Santa in his sleigh and moon to the panel. The colour scheme also changed, the original version is generally darker with a nice purple sky. I personally prefer the original version, the reprint just doesn't seem as festive. 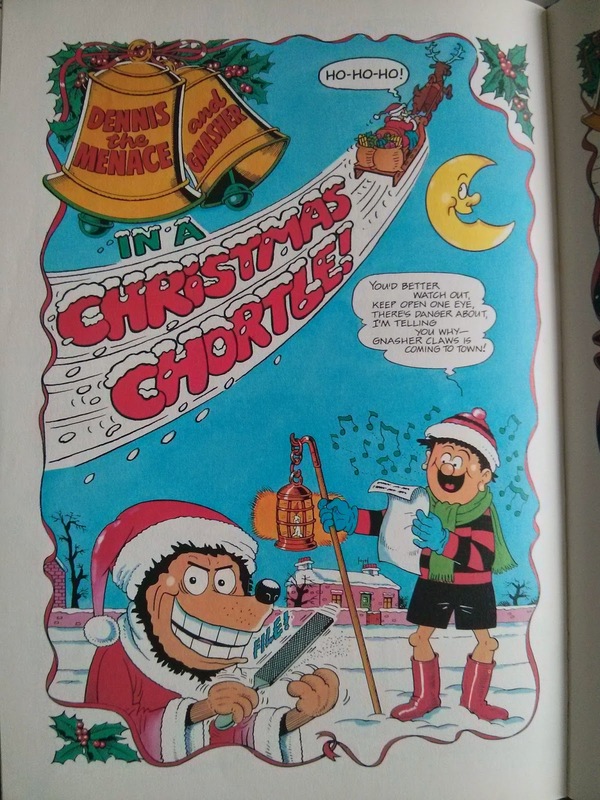 Even the bells that read 'Dennis the Menace and Gnasher' aren't as nicely coloured. Here's the full strip, the original next to the reprint. Art is by David Sutherland. As always click on the images and then again to view in full size. 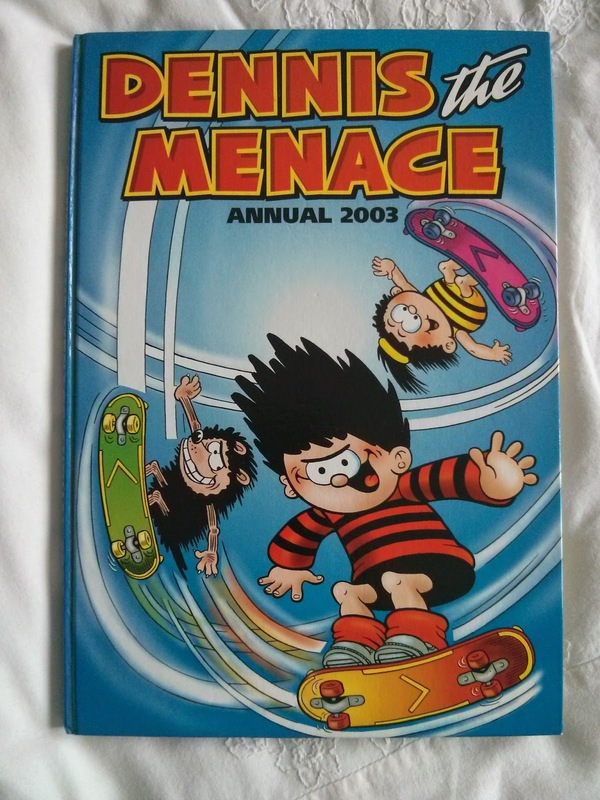 And here's the book the reprint appeared in, the 2003 Dennis the Menace annual. Many thanks to Phil Creighton for informing me of this reprint! Cheers Phil! Vulcan - First Scotland, then the World! 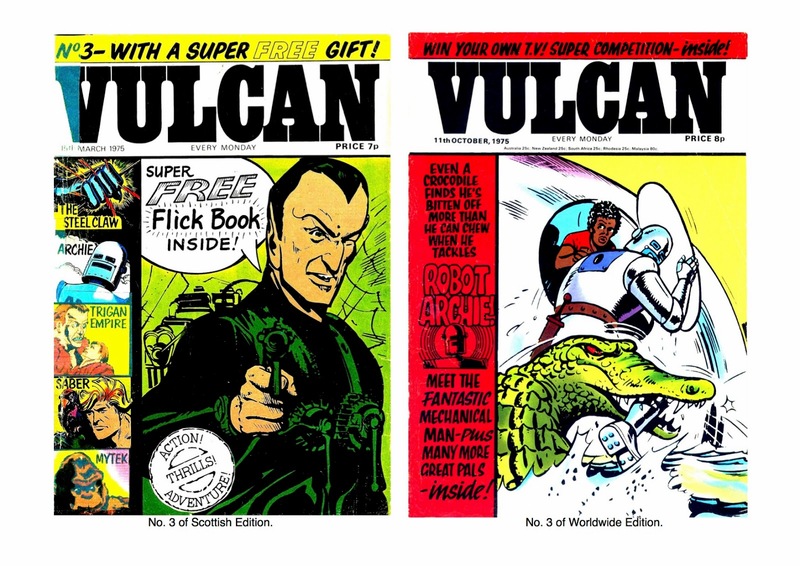 The launch of Vulcan is slightly different to the launch of most comics due to the fact that it was launched not once but twice. 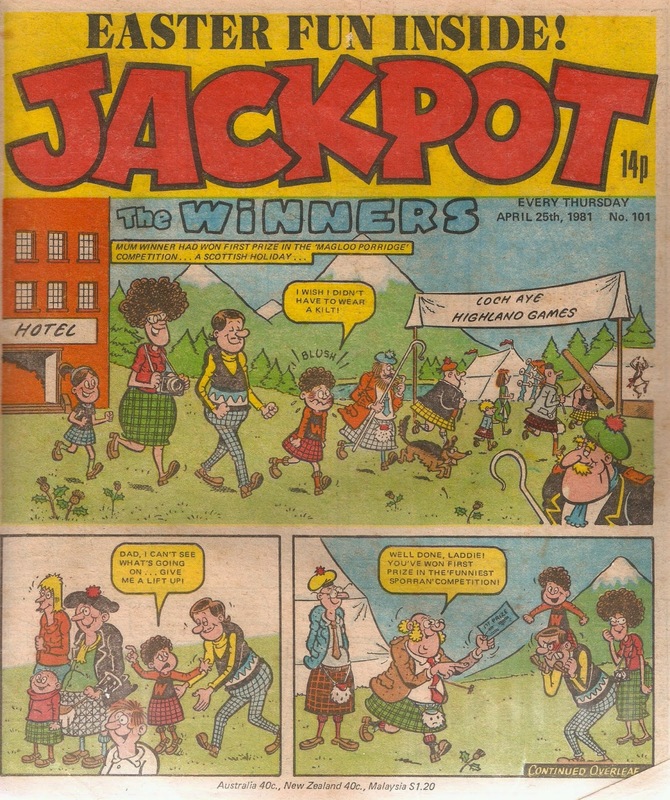 The first run was in Scotland only and issue one was released on 1st March 1975. 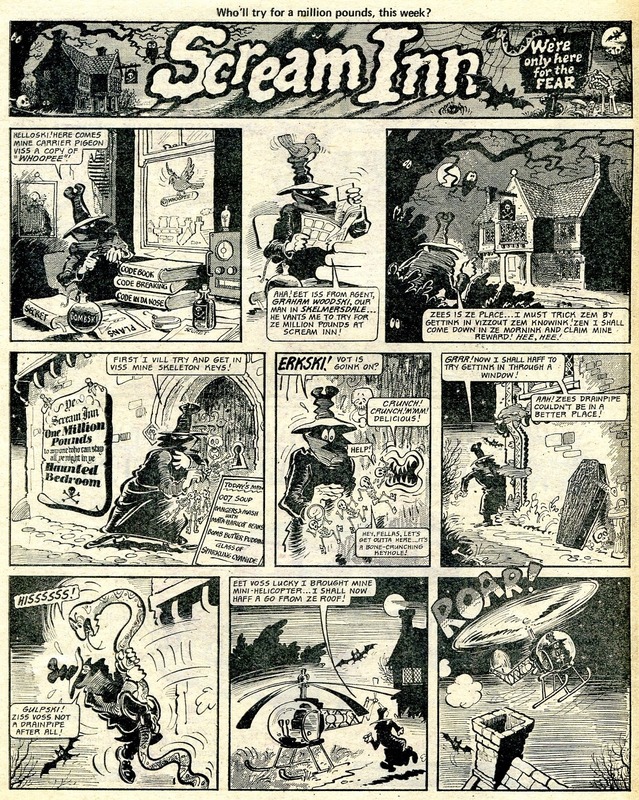 It lasted for 30 issues, with the final one coming out on 20th September 1975. This trial was considered a success and so the following week it was released worldwide, 1p dearer than the first issue of the initial run now costing 8p instead of 7p. Looking at the covers it seems as though IPC changed a lot on the second run of Vulcan - the gifts, price, cover artwork, and content was completely different. 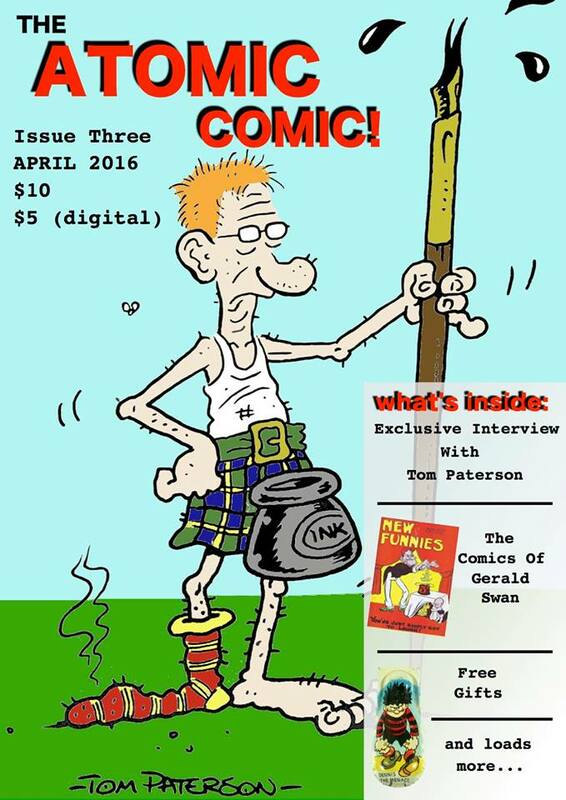 Looking through issue three of the Scottish and worldwide editions the content is very different in each, with strips either redrawn or completely replaced with new episodes - probably so that any Scottish readers wouldn't be put off buying the second series. 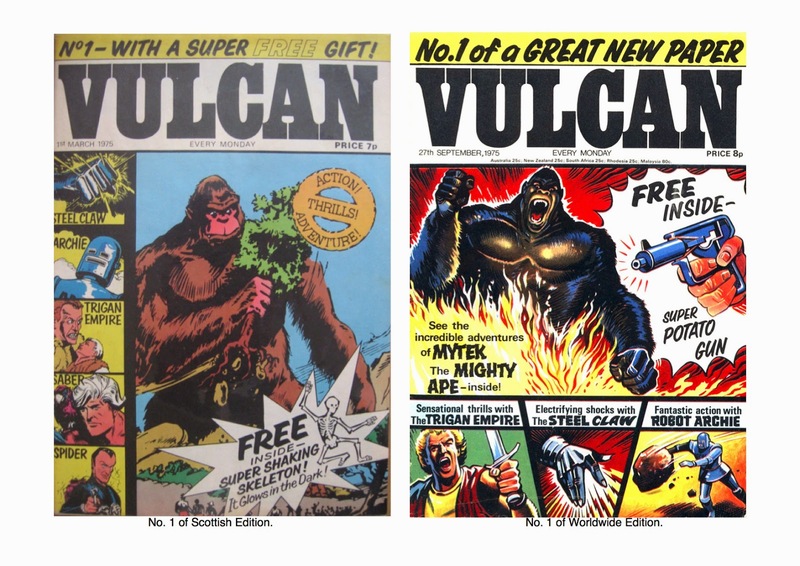 The second series wasn't as much of a success as the first, for it lasted just 28 issues before merging into Valiant on 10th April 1976 (the last issue of Vulcan was dated 3rd April). Comic characters seem to have been popular with makers of sweets and bars as quite a number of bars named after characters have been around. 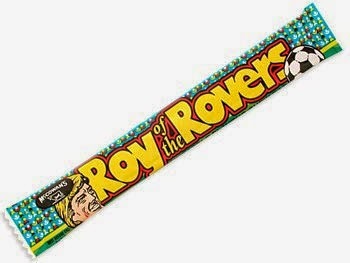 I thought I'd take a look at a few of them here, so first up is the Roy of the Rovers bar from McCowan's. These were chewy pineapple bars and were available in the 1980's and 1990's. 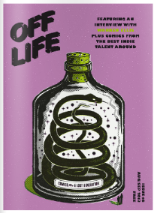 According to a fan-page made to bring them back, they are still available today, but from one store only - the Texaco garage in Glounthaune, Ireland! Next up is the Buster Bar, also from McCowan's and also from the 1980's and 1990's. These bars were given away with Buster comic at one point (I'm not sure if Roy of the Rovers bars were given away with his comic), as well as being available in the shops. They were liquorice bars coated in toffee. 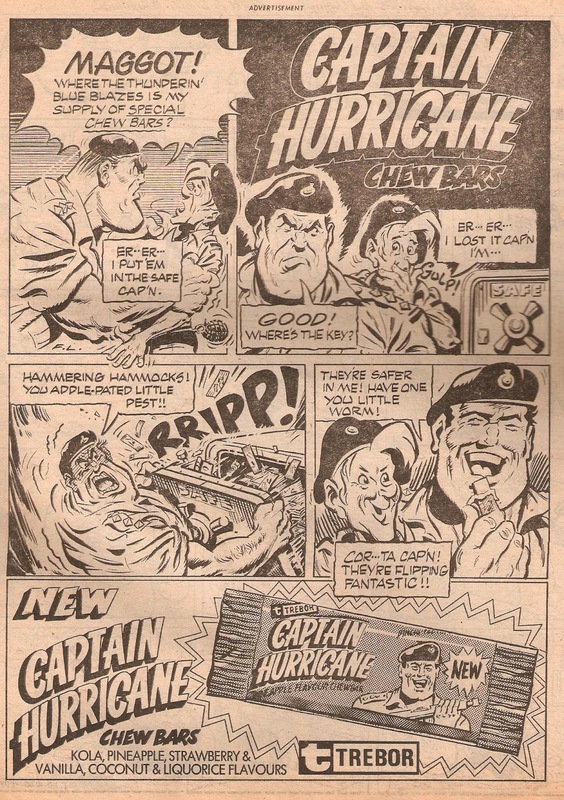 Next up is the Captain Hurricane bars. These ones are from an earlier date to the above two, coming in around the mid 1970's. Apparently delicious, the bars came in a multiple of flavours - strawberry and vanilla, coconut and liquorice, kola and finally pineapple. 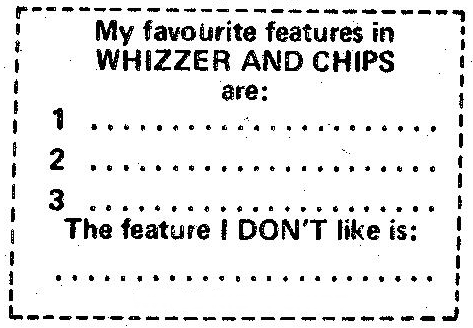 I don't have a photo of the packaging but here's a scan of a full-page advert for the bars from a 1975 issue of Whizzer and Chips. Next up is a bar featuring a D.C Thomson character. Desperate Dan was lucky enough to have a bar named after him in the 1990's. 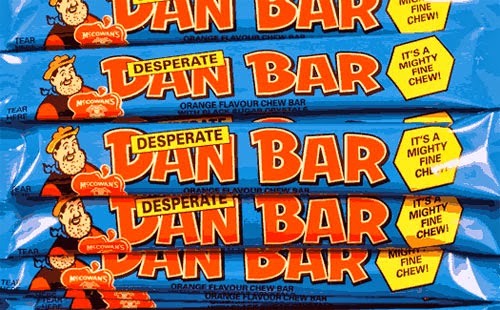 The Desperate Dan Bar was a "mighty fine chew", produced by McCowan's in one flavour - orange. 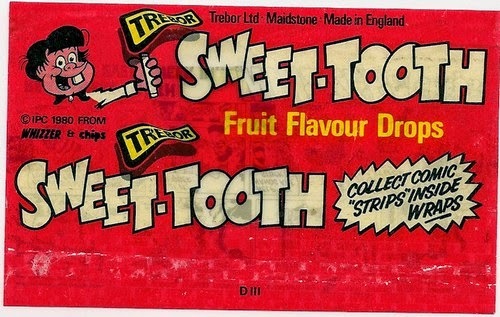 And last but not least is the Sweet Tooth Fruit Flavour Drops produced by Trebor. 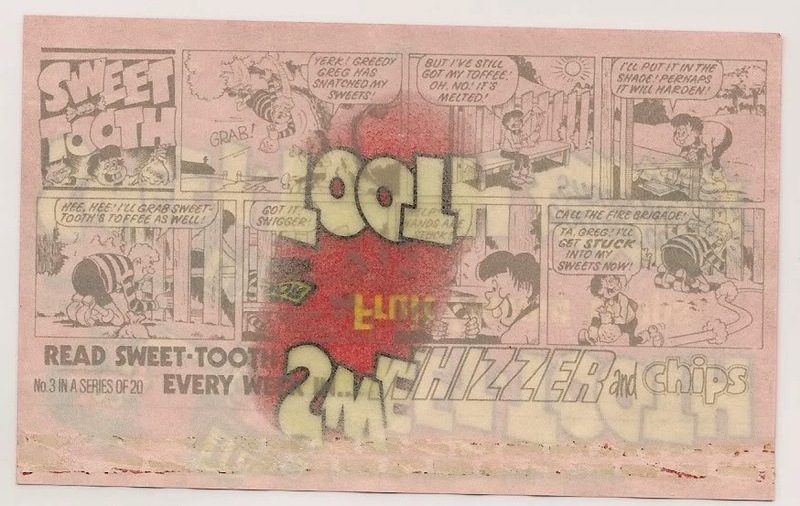 These packets each featured a comic strip from Whizzer and Chips, presumably a Sweet Tooth strip. There were twenty in total. If anybody can provide a scan of any or all of them please let me know! That concludes a look at these sweets. 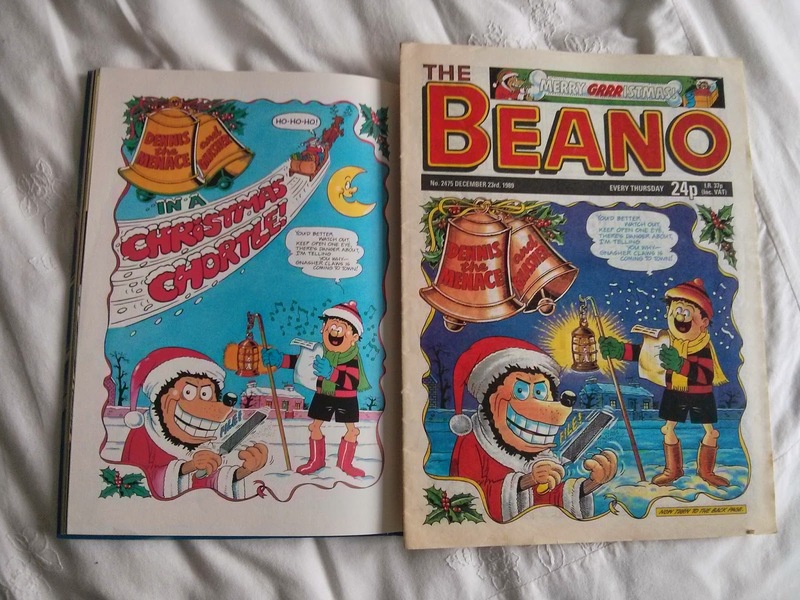 This is by no means all of them, I think the Beano brand is now very large and covers a wide variety of goodies in the supermarket.